The chance that one might find a previously lost painting by Vincent van Gogh is exciting, given that his works are now selling in the $40 to $80 million range. 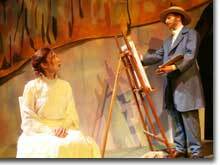 Such a boon is the premise of the regional premiere of Denver native Steven Dietz's Inventing van Gogh, now in production by the Curious Theatre Company. Building on this possibility, the playwright interweaves two realities, one present and one past: The first story involving a struggling modern artist (Patrick Stone), his professor (Miller, a van Gogh specialist), the professor's daughter (Hallie, the artist's love interest), and a scheming art critic (Bouchard, the not-so-impartial appraiser), who are all driven, with varying motives, to come up with this missing canvas; and the second story deploying some of the key moments of van Gogh's inspired yet tortured existence, including visits with his beloved fellow artist, Gaughin, his last doctor, Paul-Ferdinand Gauchet, and Gauchet's daughter, Marguerite, van Gogh's mistress and a frequent subject of his paintings. At various times the two stories intersect, with van Gogh and his present-day counterpart, Patrick Stone, interacting, the master sharing his secrets in an attempt to help Patrick recreate a respectable substitute for the work that has been lost. Establishing a quirkiness that allows him to play the entire range of Vincent's broad range of behavior—from lucid insights and expositions on the nature of art and passionate moments enthralled by the act of painting itself, to the utter lack of self-esteem and finally madness itself—Brett Aune captures the enigma of the world's most admired artist. 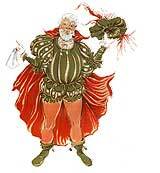 Patrick Stone's character, by contrast, is necessarily less complex, though no less personally confused. Chris Reid takes what the text initially paints as a typical angry young artist, and creates the seeds of doubt, beginning with his relationship with Hallie and moving to his evaluation of his own work, that form the basis for his growth as an artist. Interestingly, the two artists share parallel relationships with key people in their lives, allowing for three double-cast parts that hold the promise of enhancing the dynamics of the drama: Jim Zeiger taps an avuncular vein in drawing warm portraits of both Miller, Stone's former teacher, and Gachet, van Gogh's final consoling human contact; Christopher Leo brings the mental bravado of a confidence man and the sinister heart of an assassin to both Bouchard, who uses his credentials to perpetrate fraud, and Gauguin, who uses his friendship with Vincent to bully and denigrate him; and Kendra Crain McGovern finds a corresponding neediness in both Hallie and Marguerite (lovers to the two artists), while contrasting the two resentful women, one coarse and upfront, the other repressed and soft-spoken. Yet, despite this strong work, and a few scenes when Dietz lets Vincent revisit poignant thoughts from his letters or argue with Gauguin, the drama sags from a lack of clarity in the plot (who's competing with whom over painting the "real" lost portrait?) and a lack of genuiness in the dialogue between the Patrick and Hallie, and Vincent and Marguerite. It is this latter flaw, particularly in the lines written for two female roles, that reveals the dynamic imbalance at the root of the play's failure to deliver the emotional punch within its grasp: over-emphasizing the intellectual rationalizations of the men and short-changing the emotional connections demanded by the women. Marguerite sums this up when, her impatience with the artist's objectification of her finally coming to a head, she says to Vincent, "I do not want to be painted, I want to be seen." Yet she and Hallie alike are left in the lurch by their lovers and by the playwright, who fails to furnish them with any leverage in their dialogue. Would that Dietz followed Vincent's advice to "Exaggerate the essentials, leave the obvious vague." 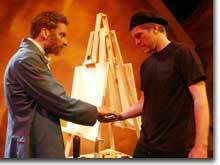 The Curious Theatre Company's production of Inventing van Gogh runs through May 22nd. 303-623-2349.